I believe it was Steve Martin who once said, "Some people have a way with words, and others...uh....not have way." That's kind of how I feel about this Fantasy Index Blackout game, where I keep on submitting my lineup yet find myself slowly slipping beneath the waves. I was 50th a few weeks back, 150th or so now, and can't say with any confidence that I'll be closer anytime soon. I'm not saying this isn't my game. But maybe the game is saying it. We'll see. Perhaps Week 10 will be more promising. In this competition, each week's high score (standard scoring) will win a $25 Fantasy Index gift certificate, and the season champ will win an enviable prize package, which may be delivered to your door if you happen to live near me. How to play: Sign into your Fantasy Index account and click the blue "Your stuff" button in the top right corner. 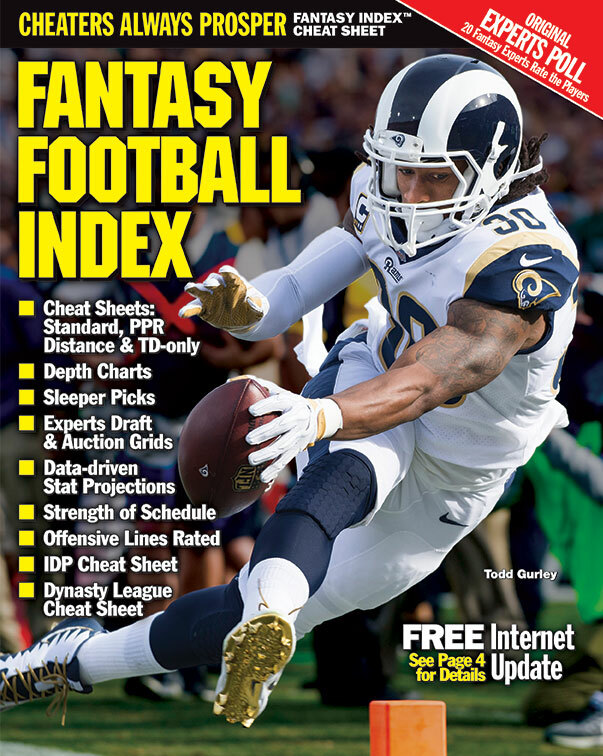 Then look for the link to Fantasy Index Blackout on the right side of the page. Pretty simple. Here's my Week 10 lineup. Quarterback: Aaron Rodgers and Drew Brees. There are a lot of good quarterback options this week. I considered both guys playing last night (Roethlisberger...sigh) and also Ryan Fitzpatrick. But I have decided instead to go with Aaron Rodgers, who's in a crummy mood after back-to-back tough losses, and Drew Brees, who's facing what is currently the league's worst pass defense. Running back: Kareem Hunt and Todd Gurley. Obviously, I love Hunt playing against what's been about the league's worst run defense. I had put Melvin Gordon in as my second choice -- he's facing what actually is the league's worst run defense -- when I discovered the magic Blackout Elves had accidentally forgotten to black out Gurley. It seems like bad business not to use the top fantasy player in the land if he's not blacked out. Gotta use Gurley. Maybe I'll replace Hunt with Gordon, I don't know. Wide receiver: Tyler Boyd, Davante Adams and Odell Beckham. Lots of good choices. This position becomes a battle of eliminating the great players for one reason or another. I decided to eliminate Michael Thomas because Sean Payton looked annoyed by the cell phone thing last week, so maybe he'll call a few more plays to other players (Dez? Or third tight end Dan Arnold?). Going with Boyd because A.J. Green isn't playing; Boyd might see 20 targets against a poor pass defense. Adams because of the whole Rodgers is ticked off storyline. Beckham because it's Monday night and San Francisco isn't good at covering people. Tight end: Jimmy Graham and Jordan Reed. Graham because he's starting to get more looks, he's still pretty good, and Miami has struggled against tight ends lately. Reed because I've got to get a piece of the Tampa Bay defense, and Reed seems more likely to get a bunch of targets than any of the wideouts. If I change it up, and I might, I'll be looking at O.J. Howard in the same game. Kicker: Adam Vinatieri and Stephen Gostkowski. Patriot kickers, old and less old. Jaguars give up a boatload of field goals, it's crazy. Gostkowski because I think New England might have a drive or two end in field goal range against Tennessee. Defense/Special Teams: L.A. Chargers and N.Y. Jets. Chargers are facing the already making offseason plans Raiders. Jets are facing the Bills, the glory of which is outlined in the Weekly. As I write this, Nathan Peterman is the only quarterback of the Allen-Anderson-Peterman grouping who is healthy. I don't want to be mean to Peterman, who is still probably one of the 97 best quarterbacks on the planet. But not an NFL starter.